The world of thrifting can seem daunting to those transitioning from the Fast Fashion world. Here are a few things I wish I had known before I started Op Shopping as an environmental practice and how I’ve found alternative ways to consume, rather than keep up with the demands of the Fast Fashion world. Look for items that are sewn with quality. This means, looking for quality stitching on the seams (especially on tailored items) and always check that your items with zippers are in good condition, and if you can replace missing buttons etc. Look for items that don’t have any loose threads, or any obvious seam holes (meaning the needle was too big for the fabric indicating poor manufacturing and an item that’s likely not to last). Look for more than simple zig-zag stitching. If your item is tailored, it is best to look for double stitching, French stitching or bound seams (seams with a fabric inlay for added durability). Ignore the dust, but check for stains and smells. Most stains and smells you can get out with proper washing and soaking methods, but you might be able to get a cheaper price for items that could’ve been overlooked IF the item is salvageable. This waxed denim Jacket was an absolute bargain, the original $300 price tag was still on it! Don’t be afraid to buy items to up-cycle or repair if you truly love the item and/or what it represents to you! You can do this yourself, or contact a local seamstress! Look for items made with organic materials. Some of my favourite pieces made with natural materials have been found for a bargain at thrift stores. Some organically compostable/natural materials include; Organic Cotton, Hemp, Cashmere, Leather, Wool, Silk (although those last four are not vegan, it’s best to buy second hand if you do), Bamboo, Rayon and, most commonly found in op shops in my opinion, Linen. Generally, It’s best to avoid purchasing inorganic synthetic materials such as Fleece, Nylon, Polyester and Spandex (and blends including these). Although the fabrics and the inks used aren’t good for your skin, it’s definitely better to buy these materials second hand than investing new and creating a further demand for these products. If you’ve suddenly noticed all of your wardrobe consists of these fabrics, let me introduce you to Guppy Bag, and can be found on their website. A friend recently introduced me to these nifty little bags that you can wash your inorganic clothes in. They catch the micro-fibres that shed when you put your synthetic clothes in the wash (did you know a piece of clothing shed up to 1,900 microfibres each wash?!) and ultimately are an incredible tool that needs to be utilised by everyone in order to halt our micro-plastics problem. For more info about micro-plastics in our ocean please reference my Ocean Action Blog post. Have fun! Part of the joy of op shopping is being able to buy something you wouldn’t usually buy without the guilt of the high price-tag or feeding into a fashion companies economic agenda. I love buying bright colourful and glitzy items for parties (at discount) knowing I can pass it on or donate it back or forward when I’m done as if I’m renting the item. Whilst this can seem to be a watered down version of Fast Fashion, it is definitely a shift from my old shopping mentality! A couple of my favourite Op Shop finds! Still amazed I found a BrainTree cardigan for $3!! Check is there’s a clothes swap party/event happening in your town. These are easy to find through Facebook, or even through Google where some online organisations have quick-listed their events. There are lots of Clothes Swap/ Clothes for Sale pages on Facebook and Instagram. Look around for one that suits your style. You might even make some money from clothes sitting in your own closet whilst your browsing for your preferred items! Look out for different Swap Meets in your area. You might have seen these happening in the morning on weekends at different Shopping Centre car parks, or even at schools. Swap Meets in my experience are a great way to find ‘new’ items for a cheaper-than-thrifting price.I have bought so many beautiful and inexpensive quality items from people looking to travel and are simply trying to get rid of excess items to save for their trip. It’s much easier to haggle in these environments AND you get to meet the person before purchasing! 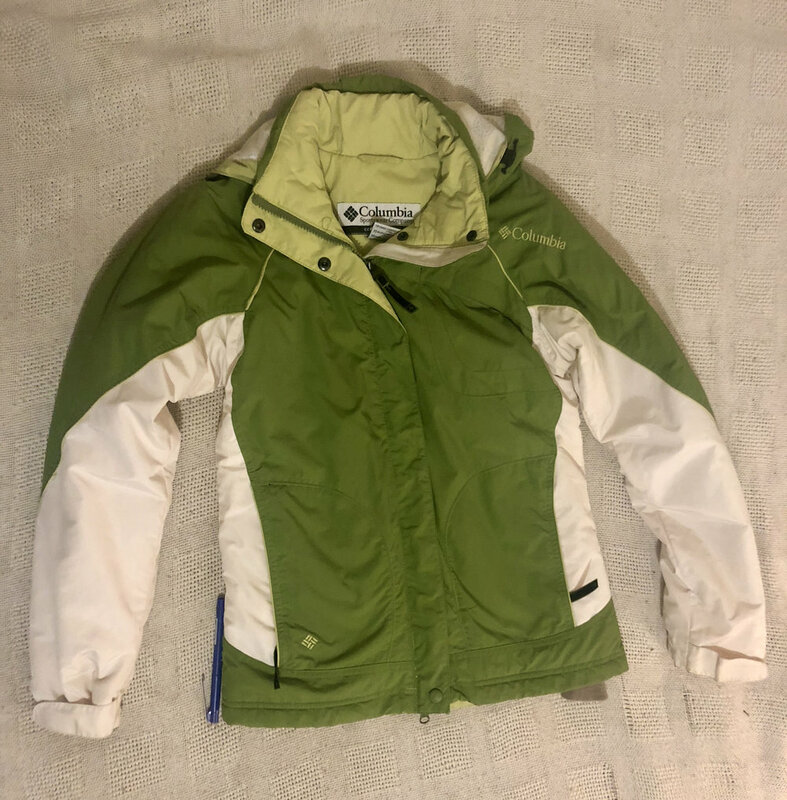 I traded this Columbia brand Winter coat with a girl from a bartering FaceBook page for a jar of Tahini and some Avocado’s! LOVE YOUR CLOTHES! Love your clothes and what you buy so much, that you want to wear them again and again. If you feel overwhelmed by your closet, a good idea is to simplify for a couple weeks. I decided to minimize my wardrobe and created a temporary Capsule Wardrobe (selecting around 30 items and wearing them in different ways to create new looks). By giving yourself a smaller selection temporarily, it’s easier to figure out what styles you really feel like you could wear timelessly. If your clothes look good on you, why wouldn’t you want to keep wearing them! And by putting your clothes away for a while instead of donating them straight away, you’re more likely to go back and sift through be drawn to your items again. There are countless ways to involve your closet with the social revolution that is currently taking place. All you need to start with is to stop the Fast Fashion ‘seasonal’ cycles and stop buying from Fashion chain stores! It’s time to break free from the invisible force that is telling us to dress a certain way and interrupting our indulgence in our true colour palette and what clothes are tailored to suit our unique body shapes. By taking charge of what we buy, and HOW we buy, we are not only reducing stress and expectation in our own lives, but transforming the silent lives of those that have been creating our clothes for decades. By breaking free from Fast Fashion, these silenced lives are given a voice and we can give opportunity from unimaginable suffering we have been unconsciously supporting. Be a part of the Fashion Revolution! And please watch True Cost to find out more on how Fabric and Ink production has become a detriment to the health of Indian citizens and India’s soil and waterways. Get involved with Slow Fashion! What’s your way of embracing the Fashion Revolution? Let me know how you’re making your statement, show me your amazing Op Shop finds, or tell me about your new favourite label!! And check out fashionrevolution.org to find out more information and for resources to get you involved! You can follow Drea's sustainable journey through her blog, inthemaez, by clicking HERE.